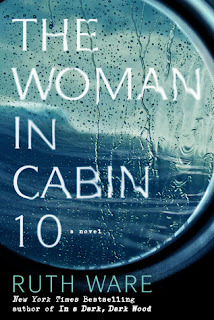 The Premise from the Publisher: "In this tightly wound, enthralling story reminiscent of Agatha Christie’s works, Lo Blacklock, a journalist who writes for a travel magazine, has just been given the assignment of a lifetime: a week on a luxury cruise with only a handful of cabins. The sky is clear, the waters calm, and the veneered, select guests jovial as the exclusive cruise ship, the Aurora, begins her voyage in the picturesque North Sea. At first, Lo’s stay is nothing but pleasant, but as the week wears on, frigid winds whip the desk, gray skies fall, and Lo witnesses what she can only describe as a dark and terrifying nightmare: a woman being thrown overboard. The problem? All passengers remain accounted for—and so, the ship sails on as if nothing has happened, despite Lo’s desperate attempts to convey that something (or someone) has gone terribly, terribly wrong..." (SS). My overall thoughts and review: As some of you know, I work at Indigo and each month we spotlight a book for Staff Pick of the Month. The most recent pick to that list is Ruth Ware's book, The Woman in Cabin 10. I instantly bought it when I got into work when it released. This was my first time picking up something from Ruth Ware. I've loved all the SPOTM reads before, and I was especially excited for this one because it fell under the umbrella of thrilling reads / gripping literature / mystery. I've been a huge fan of these kinds of books for a while now and the fact that this one took place on a fancy boat.. I was instantly intrigued. Was anyone thinking Titanic?? I know I was. You are first introduced to Lo who is a journalist to a travel magazine and she has an opportunity to travel on a luxury cruise with select passengers. The reader also learns from the beginning that Lo experiences a break-in at her home, so she tries to concentrate on the trip, but obviously there's some emotional trauma backlash from the break-in experience. You are introduced to a grand cast of characters, everyone has a reason to be on the boat and everyone is there for their own purposes; be that to write their own journal piece, take photos or simply to hang out with the Bullmers (the owners of the Aurora). One evening, Lo believes that she witnesses a horrible accident: a body being thrown overboard. She starts investigating with the cruise ship staff but there is no one unaccounted for. The staff begin to judge Lo's judgement and the reader begins to untangle all the different alibis and narratives of each character on the cruise. It felt like a bit of a Clue game during these moments and I really enjoyed that. I will say, I did not see the giant twist/conclusion coming. It is a clever one. I liked how every character was suspicious and the scenes where she wrote about Lo's internal voice were absolutely chilling. I would hate to be in her position: alone and thinking the absolute worst and having no one believe you. The only reason the book did not get a full five stars from me was because I felt it wrapped up too quickly towards the end. There was a lot of groundwork to set up the pacing of the book but towards the end, I felt it was done so quickly. I wanted a bit more conclusion. But overall, I enjoyed this read. It definitely makes me want to go out and pick up Ware's other books. If you are a fan of Clare Mackintosh and Paula Hawkins, this one is definitely for you! The Premise from the Publisher: "For as long as she can remember, it’s been just Ariel and Dad. Ariel’s mom disappeared when she was a baby. Dad says home is wherever the two of them are, but Ariel is now seventeen and after years of new apartments, new schools, and new faces, all she wants is to put down some roots. Complicating things are Monica and Gabe, both of whom have stirred a different kind of desire. Maya’s a teenager who’s run from an abusive mother right into the arms of an older man she thinks she can trust. But now she’s isolated with a baby on the way, and life’s getting more complicated than Maya ever could have imagined. Ariel and Maya’s lives collide unexpectedly when Ariel’s mother shows up out of the blue with wild accusations: Ariel wasn’t abandoned. Her father kidnapped her fourteen years ago. What is Ariel supposed to believe? Is it possible Dad’s woven her entire history into a tapestry of lies? How can she choose between the mother she’s been taught to mistrust and the father who has taken care of her all these years? In bestselling author Ellen Hopkins’s deft hands, Ariel’s emotionally charged journey to find out the truth of who she really is balances beautifully with Maya’s story of loss and redemption. This is a memorable portrait of two young women trying to make sense of their lives and coming face to face with themselves—for both the last and the very first time" (Margaret K. McElderry Books/SS). My overall thoughts and review: It has been a while since I've read a book by Ellen Hopkins. I own all of her books but I haven't gotten around to reading them all. I've always been a fan though. I can remember being in my final years of university and my friend, Michelle, was talking about Crank and she got me onto reading these books. Hopkins write in a prose/poetry style that is incredibly unique and she builds such strong characters with an internal voice. I also really like it when Hopkins merges multiple narratives. In The You I've Never Known, Hopkins gives us two stories: Ariel and Maya. Ariel's parts are written in the prose/poetry style I mentioned and Maya's parts are written in a letter/journal structure. Both characters are incredibly different and you definitely get more of Ariel's narrative. I don't want to spoil the twist, but I did see it coming about half way through (Michelle and me were messaging each other on facebook, going we had figured it out). Even though I figured it out, I really liked how the text came full circle. Both characters have some things in common like trying to figure out their identity, sexual identity and finding their place in the world. I liked how there was a large emphasis on friendship and family in the text. Even though there was a large part on relationships (Ariel with Monica & Ariel with Gabe), Hopkins also emphasized on the importance of family by showing us Monica's family and speaking about Gabe's family. Again, I don't want to say too much without spoiling the text, but as someone who grew up with a single mom and has a strong relationship with my mom, this text really struck a chord with me. I found myself getting emotional a few times reading Maya's passages. At the end of the day, I think what I enjoy most about Hopkins' books is that, she does not sugarcoat anything. Everyone has their own struggles and sometimes, it can be really messed up things and I like that she does not shy away from that. She has very complex characters and some characters you even hate (Jason is awful! ), but I loved how "real" it was. I think I've said this before in regards to her other novels, but she offers the reader such realistic narratives; it doesn't necessarily end in flames, but it also does not have a neat ending all wrapped in a bow. 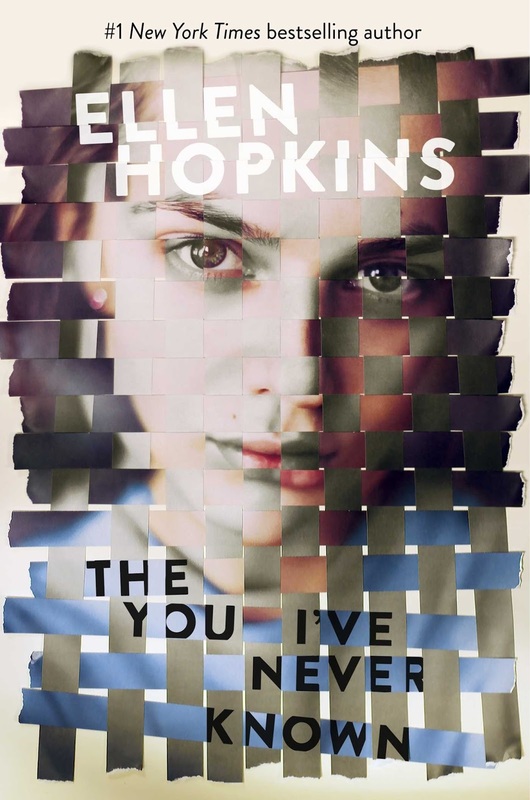 If you are a fan of Hopkins' other books, you will definitely enjoy this one. It is a great and addictive read about finding yourself, falling in love, friendship and most importantly, family. The Premise from the Publisher: "Scarlett has never left the tiny island where she and her beloved sister, Tella, live with their powerful, and cruel, father. Now Scarlett's father has arranged a marriage for her, and Scarlett thinks her dreams of seeing Caraval, the far-away, once-a-year performance where the audience participates in the show, are over. But this year, Scarlett's long-dreamt of invitation finally arrives. With the help of a mysterious sailor, Tella whisks Scarlett away to the show. Only, as soon as they arrive, Tella is kidnapped by Caraval's mastermind organizer, Legend. It turns out that this season's Caraval revolves around Tella, and whoever finds her first is the winner. Scarlett has been told that everything that happens during Caraval is only an elaborate performance. But she nevertheless becomes enmeshed in a game of love, heartbreak, and magic with the other players in the game. 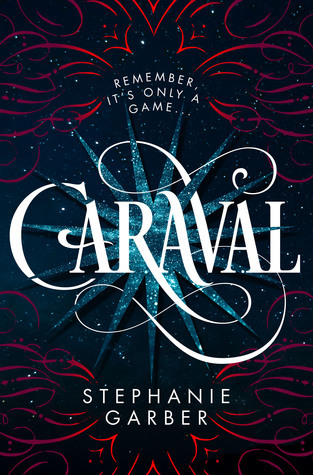 And whether Caraval is real or not, she must find Tella before the five nights of the game are over, a dangerous domino effect of consequences is set off, and her sister disappears forever" (Flatiron Books). My overall thoughts and review: When I first read the premise of this book, I instantly thought to myself The Night Circus by Erin Morgenstern. 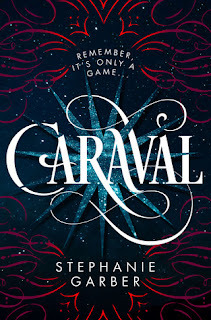 It has been quite some time since I've read that book, but immediately, I felt intrigued by this text and wanting to explore the world of "Caraval" - Caraval is described as a once-a-year show that moves around and audience members can participate. There seems to be interactions, games and challenges and I was also thinking of Alice in Wonderland connections too. I really did not know what to expect, but I can firmly say that I really loved this book. To begin with, the book utilizes the element of letters in the text. I love reading letters and I just find it adds another layer to each character. Also, you are introduced to Scarlett and Tella, two sisters who are both incredibly different but it is clear that their relationship is quite strong and they love one another a lot. I don't often like reading narratives where there is immediately family drama and this was a nice change. The reader can see Scarlett struggling to secure a future for her and Tella, while Tella attempts to protect them both from their father's wrath. The world of "Caraval" and this mystical individual named Legend is introduced. He is the one who has created Caraval and has this one year, given the girls a chance to attend the performance. They meet a mysterious sailor by the name of Julian who is going to help them get there and to play the game. Things are immediately complicated once they depart on their journey, and it only gets more confusing when Scarlett and Tella are separated. Scarlett must rush to find her sister through all the riddles and puzzles and as she does, she learns of the magical world of Caraval but also learns more about herself. I really enjoyed this book. I found myself grinning a lot because I just loved the dialogue between the sisters and the dialogue between Scarlett and Julian. Each character felt so vivid to me and even the ones I did not particularly enjoy (there were some antagonists in the text), were written so well. Also the descriptions of the environment/world of Caraval were wonderful. I could see it all coming to life in my mind as I was reading it. I really liked how clever the text was too and every time I thought I figured out the plot and could see where the story was going next, I was constantly surprised. 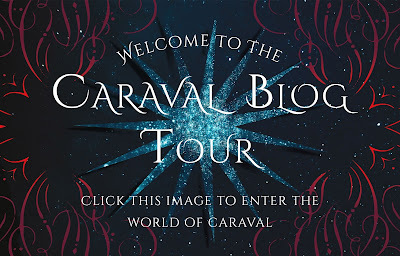 I really hope that Garber plans to write more of this Caraval world and its characters because I was quite sad when I finished the book. I loved everything about it and it has been a while that a fantasy novel like this has drawn me in so quickly. 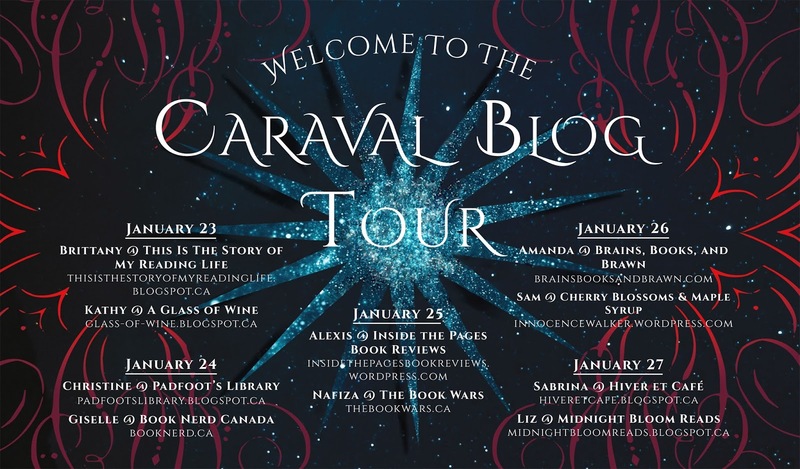 I think fans of The Night Circus, Alice in Wonderland and Marissa Meyer's Heartless, would definitely enjoy this! This was an easy 5 stars for me. Loved, loved, loved it! The Premise from the Publisher: "Hawthorn wasn't trying to insert herself into a missing person's investigation. Or maybe she was. But that's only because Lizzie Lovett's disappearance is the one fascinating mystery their sleepy town has ever had. 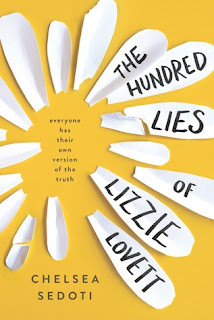 Bad things don't happen to popular girls like Lizzie Lovett, and Hawthorn is convinced she'll turn up at any moment-which means the time for speculation is now.So Hawthorn comes up with her own theory for Lizzie's disappearance. A theory way too absurd to take seriously? at first. The more Hawthorn talks, the more she believes. And what better way to collect evidence than to immerse herself in Lizzie's life? Like getting a job at the diner where Lizzie worked and hanging out with Lizzie's boyfriend. After all, it's not as if he killed her-or did he?Told with a unique voice that is both hilarious and heart-wrenching, Hawthorn's quest for proof may uncover the greatest truth is within herself" (Sourcebooks Fire). My overall thoughts and review: I've been on such a mystery/thriller kick recently and when I read the premise for this book, I knew I had to pick it up. From the first page, the reader is immediately thrown into Hawthorn's world, or rather, Hawthorn's mind. I must admit, in the beginning, I was quite reluctant and I found it hard to get on board with the text. Hawthorn is kind of "prickly" but you quickly learn as a reader, the inner workings of her mind. She goes to school with some pretty hostile people, like the character Mychelle. Hawthorn finds her life as boring and when the mystery of what really happened to Lizzie Lovett comes up, she finds herself diving straight into it. She begins to explore where Lizzie used to work and even starts hanging out with her boyfriend, Enzo. The story isn't so much about Lizzie (well yes, it is, Hawthorn becomes obsessed with what happened to her), but it really becomes about Hawthorn learning more about herself and coming to terms with who she is. The text touches on her relationship with her bestfriend, and how that changes when you add other relationships to the mix. The text also speaks about her relationship with her brother, and what that is like, being the kid sister. You also see how her family life is which shapes everything nicely. I will say, what I appreciated most about this book was that Chelsea does not sugarcoat things at all for the reader. Trigger warning, there is some dark subject matter. That might not be apparent from the beginning of the book because of Hawthorn's unique perspective and personality, but do go into this book with an open-mind. I said earlier on, I found it hard to empathize with Hawthorn, but as I kept reading, she genuinely grew on me. She wasn't a perfect character, but I got to understand why she was so interested in Lizzie Lovett, and she kind of reminded me of myself a bit. I definitely had some far-fetched ideas as a teen and although, Lizzie's idea of what happened is quite surreal and strange, I feel like this was her way of coping with what happened. We cope and manage in different ways and sometimes really strange ways. High-school years can be some of the toughest years for some individuals and Chelsea gives the reader a pretty good example of how dark and lonely high-school can be. Some believe that it can be the best years of your life, but the harsh reality is that many deal with cases of bullying on a daily basis. The text also speaks a lot about expectations and ideals. That because we give off a certain persona, we are expected to rise to a certain standard and into people's expectations. Overall, I feel like this YA read was definitely something I've never encountered before. It spoke about high-school, bullying, depression/anxiety, family, friendship and falling in love, and all from a very unique character like Hawthorn. If you are a fan of John Green's Paper Towns or Andrew Smith's Winger, I definitely think that you will enjoy this read! 1. What part of the text was the most difficult for you to write? 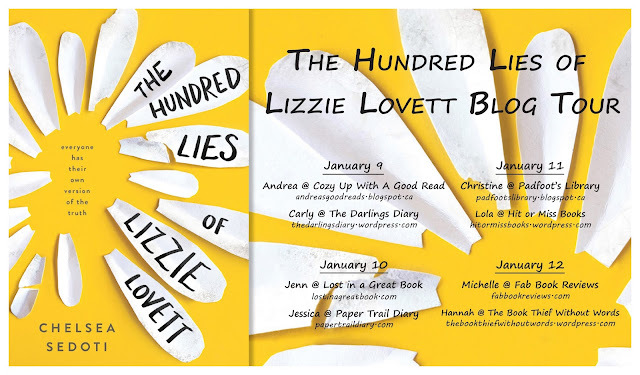 Writing the last chapter of The Hundred Lies of Lizzie Lovett was devastating. Not for the reason some people struggle with final scenes. It wasn’t devastating because of the content, or because I was so invested in the character’s emotional journey. It was because I didn’t want to stop writing. Hawthorn and her story had lived in my head for years before I put anything on paper. Over time, I’d come to know Hawthorn so well. She became a part of me. I was convinced I’d never love another of my characters as much as I loved her. When it was time to say goodbye to her, it felt like saying goodbye to an old friend. Writing the final words should have been a celebration, because finishing a novel is a huge accomplishment. Instead, I cried. I literally cried. At the time, I didn’t know what would happen with the book. Would it ever be published? Or, after all that effort, would I put Hawthorn aside, never to be looked at again? For all I knew, The Hundred Lies would be my first and only novel. Typing “The End” felt so very final. Clearly, the outcome of this story is already spoiled for you. The Hundred Lies of Lizzie Lovett got published. Hawthorn didn’t have to fade out of my life. And I did write a second book. It turns out, there are characters in it who I love just as much as I love Hawthorn. When I wrote the final chapter of my second book, I didn’t cry. Because I knew very well that there would be more stories in my future. More characters who would eventually feel like friends to me. I’m confident now that there’s no reason to grieve the end of a book. But man, writing that last chapter of The Hundred Lies of Lizzie Lovett was tough. Thank you so much, Chelsea, for taking the time to answer my question. Writing the ending is definitely the author saying goodbye to the characters you have created and come to love. I look forward to seeing what you write next :) I want to thank the lovely folks over at Raincoast for this lovely opportunity as always to participate in their blog tours and Chelsea for speaking with us bloggers. Please take a moment to visit the other stops on the tour and check out my fellow bloggers' reviews and their own specific questions for Chelsea!